El Alamein is best known from its military history. The battle of El Alamein was an important moment in the sway of power between the Allied and Axis forces in North Africa during World War 2. It is seen as one of its decisive victories. 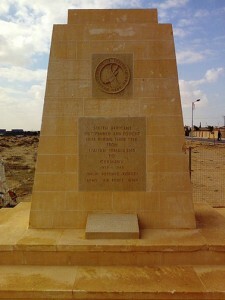 Nowadays, nearly every monument and landmark within El Alamein’s environs is dedicated to this event and the soldiers who gave there live here. The El Alamein Battlefield is a haunting desert landscape featuring many memorials and battle related attractions. It contains the graves of men who died at all stages of the Western Desert campaigns, brought in from a wide area, but especially those who died in the Battle of El Alamein at the end of October 1942 and in the period immediately before that. There are separate memorials for the soldiers from each of the countries who fought on this battlefield. Along with the War Museum, all of the Allied memorials are located around the War Cemetery, so there are plenty of attractions to see. 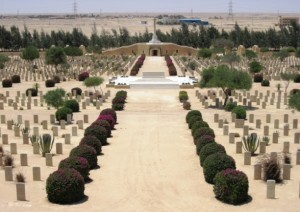 One of the most impressive sites at the El Alamein battlefield is the Commonwealth War Cemetery, also known as the British Memorial, on the eastern side of the town. There are 7,367 burials in the cemetery, of which 821 are unidentified by name. The white tombs, of the soldiers from Great Britain, New Zealand, Australia, South Africa, France, India and Malaysia fallen in World War 2, are ordered in long structured lines and dot the desert floor outside. The names of a further 603 men, whose remains were cremated, are commemorated on the Cremation Memorial within the cemetery. The white limestone Alamein Memorial bears the names of 11,874 soldiers and airmen who have no known grave. The memorial cloister, some 80 m long, is entered through three arches leading to a wide hall with broad stairs leading up to a rooftop with stunning views of both the memorial and the Mediterranean Sea. 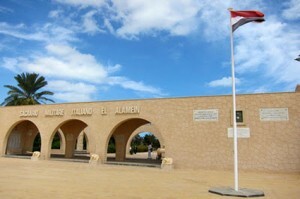 The Italian War Memorial is the largest structure at El Alamein’s Battlefield. 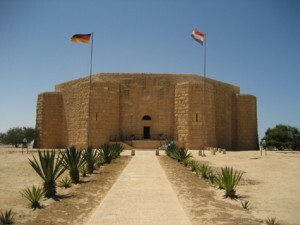 It is located at the Tel el Eisa Hill overlooking the Mediterranean Sea and the surrounding desert. You walk along a wide path up the hill to an impressive but elegant white marble tower, which contains a mosque, chapel and even a small museum. The 4,800 Italian soldiers who lost their lives, and the 38,000 who were lost at sea, are remembered by inscriptions on the walls. The German War Memorial looks more like a hermetically sealed sandstone fortress. It is an eye catching singular octagonal structure remembering the battle’s many fallen German soldiers. Inside this imposing memorial, in typical austere Teutonic style lie the tombs of 4,280 German servicemen. It has a memorial obelisk in the centre. The view from the Tel el Eisa hilltop over the Mediterranean is worth a visit alone. 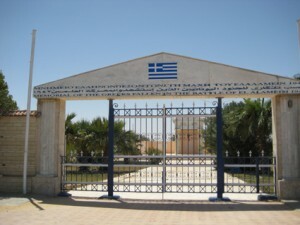 There is also a Greek memorial erected in the form of temple, which stands on the south side of the El Alamein battlefield. It is approached by a small avenue of oleanders. As part of the Axis alliance, the Libyan soldiers fought side by side with the Italians. Due to the differences of their religious burial traditions however, they have their own memorial site at El Alamein, A stately mosque stands amid a wonderfully colourful garden. 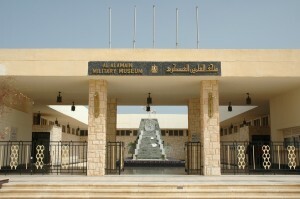 The Military Museum in El Alamein sheds the light on the four main countries – Great Britain, Germany, Italy and Egypt – that were involved in the World War 2 battle of El Alamein and its circumstances. The indoor part of the museum houses a collection of memorabilia, weapons, uniforms and other artefacts from the battle of each country involved in the Battle of El Alamein and the North African campaigns. Maps and audio recordings tell the stories from both sides in the battle in Arabic, English, German and Italians. Outside the building, you’ll find in the garden massive tanks, artillery and other military vehicles, which operated during the famous battle.